Religions in the United States grow and shrink because of immigration, births, deaths and many other factors, but a recent report from the Pew Research Center offers a chance to look in detail at which religions are gaining and losing members the old-fashioned way: by recruiting new members. Pew took a look at which religions have gained and lost followers when people change faiths, and we used its data to run the tape forward and see which religions would be on the rise if people kept switching at the current rates. This model isn’t a projection of the future (because it doesn’t take into account other factors); instead, it’s a way to measure the pull that religions are exerting on potential converts at present, by taking today’s trends to their logical conclusions. In its 2014 Religious Landscape study, which surveyed more than 35,000 Americans, Pew asked respondents about their current religious practice and the tradition in which they were raised. Pew found that the group of Americans who are unaffiliated with any religion gained the most members, on net, from religious churn. Although only 9.2 percent of Americans reported being born into a religiously unaffiliated household, 22.8 percent described themselves as unaffiliated by adulthood. The share of Americans who are Christians, as a whole, dropped 15.0 percentage points (from 85.6 percent at birth to 70.6 percent at present). 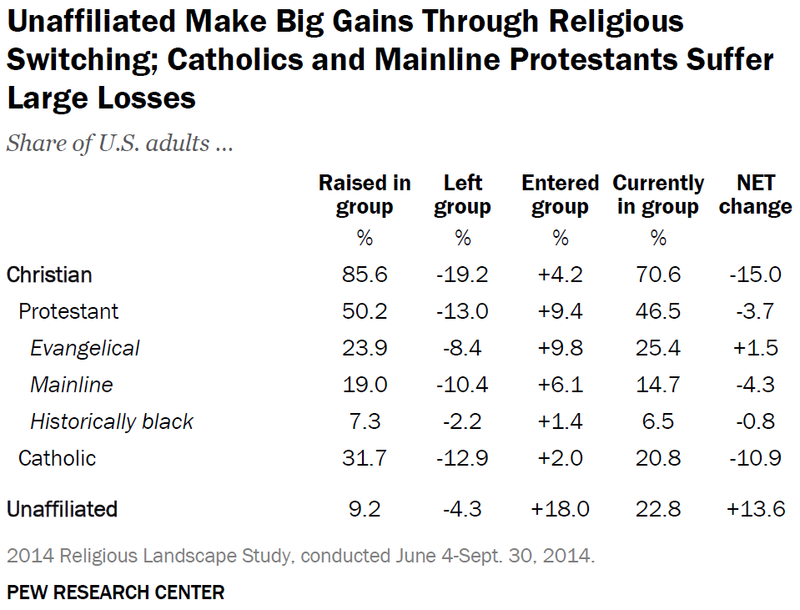 Pew highlighted some of the most dramatic swings in the table below but also collected data on seven additional denominations. If conversions went on as they do today and all other factors were held steady, America would wind up with the religious demographics of the stable distribution. But there would be substantial redistribution among Christian groups, with evangelical Protestants gaining (26 percent at present to 32 percent) and Catholics losing more than half their current share of the population (21 percent to 8 percent). Unaffiliateds gain ground in the conversion only model of religious churn, but they wind up below their current share of the population when fertility is taken into account. Unaffiliateds have kids at a rate that is below replacement (1.7 children per woman), so their gains through deconversions are whittled away. Mainline Protestants have the same problem. Mormons do much better when fertility is factored in because they have the highest fertility rate (3.4 children per woman). Comparing the two models, with and without fertility, reveals which traditions are currently strong attractors for people changing faiths (evangelical Protestants and unaffiliateds) and which would benefit much more from creating new members than converting new members (Mormons and Muslims). In either model, Catholics wind up as one of the biggest losers even though their odds of retaining the children born into their faith are in the middle of the pack. They’re not a strong enough attractor of people leaving other faiths to replenish the people they lose, and so their share diminishes to the single digits. Pew’s conversion data makes it clear that the biggest gainers (evangelical Protestants and unaffiliateds) are succeeding in “making disciples of all nations,” drawing converts at high rates from a wide range of faiths. CORRECTION (May 19, 2:29 p.m.): A previous version of this article incorrectly said Catholics and evangelical Protestants had the second- and third-highest fertility rates among all religions. This model tracks the relative proportions of these groups. Sixty-nine percent is the proportion of Christians relative to the other groups among the 12 tracked. For consistency, I used the same grouping as in the Pew report: Catholics, evangelical Protestants, historically black Protestants and mainline Protestants were counted in “Christian,” but Orthodox Christians, Mormons, and Jehovah’s Witnesses were counted as separate groups. 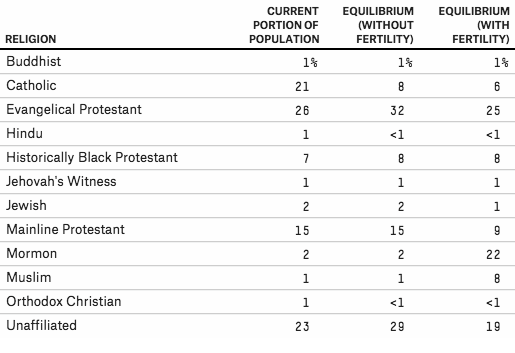 If Orthodox Christians are included (because they are theologically more similar to Catholics than Protestants are), the overall totals for Christians are 70 percent at present, 63 percent at equilibrium. Pew had data on completed fertility rates (the number of children ever born to women ages 40-44) for Catholics, evangelical Protestants, historically black Protestants, Jews, mainline Protestants, Mormons and the unaffiliated. Fertility estimates for Muslims were set using the total fertility rate (the projected number of children women will have) as calculated for the United States by Pew in “The Future of World Religions: Population Growth Projections, 2010-2050.” No U.S.-specific fertility data was found for Buddhists, Hindus, Jehovah’s Witnesses or Orthodox Christians, so all were assumed to have the average U.S. fertility rate.